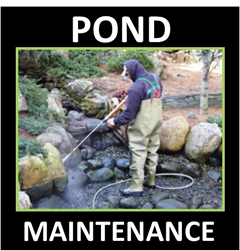 Pond filters and pond pumps are essential in maintaining a healthy, clean, clear pond or water garden. Pond filters can be placed inside the pond (submersible filters), or outside the pond (external filters). Pond pumps can be used to push water through the filter, or to make a water fall, operate a fountain, or for simple water circulation and oxygenation of the pond. 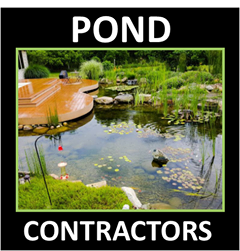 Our PONDS Contractor members offer a wide selection of internal and external pond filter services and water pumps that is sure to meet the needs of your pond or water garden. Combining science with simplicity, there are new and improved lines of pond water treatments these days that make it simple to maintain a healthy, well-balanced water garden with proper pond filtration and aeration. New pump top liquid bottles and bubble tabs make dosing simple and affordable. 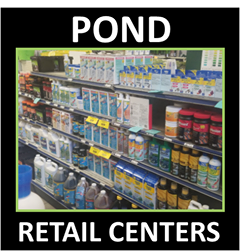 Put away your calculators and enjoy a clean, clear, healthy pond with the complete line of algae control, beneficial bacteria, flocculent and other water treatment products. Some pond may require UV lights bulbs and other methods of killing alage. If you aren't replacing your bulb at least once a year, this might be the problem at hand. Many bulbs wear out quickly, the bulb will turn on but it loses it's intensity, and therefore it's ability to control the algae in your pond.